HE geographical range of the Arizona Jay is in southern New Mexico and Arizona and south into Sonora and Chihuahua, Mexico. It is a common resident throughout the oak belt which generally fringes the foothills of the mountains and ranges well up among the pines. In suitable localities it is very abundant. It is rarely seen at any distance out of the arid plains; but after the breeding season is over, small flocks are sometimes met with among the shrubbery of the few water courses, several miles away from their regular habitat. They are seen in the early Spring, evidently on a raid for eggs and the young of smaller birds. On such occasions they are very silent, and their presence is only betrayed by the scoldings they receive from other birds. On their own heath they are as noisy as any of our Jays, and apparently far more sociable, a number of pairs frequently nesting close to each other in a small oak grove. They move about in small family parties of from half a dozen to twenty or thirty, being rarely seen alone. They are restless, constantly on the move, prying into this or that, spending a good portion of their time on the ground, now hopping on a low limb, and the next minute down again, twitching their tails almost constantly. Their call notes are harsh and far reaching, and are somewhat similar to those of the California Jay. The habits of the Arizona Jay are similar to those of its brethren. Its food consists of grasshoppers, insects, animal matter, wild fruits, seeds, and especially acorns. It flies by partly closing its wings, darting suddenly down, then up again, and repeating these movements for some time. It mates about the end of February. The nest, composed of dry rootlets laid very closely in rings, is usually found in an oak sapling about ten feet from the ground. The inside diameter is five inches, and depth one and three-fourths inches. It is like a deep saucer. The Arizona Jay is considered a foothill bird, not going far into the pines and not appearing on the plains. But one brood appears to be raised in a season, and nesting lasts about sixteen days. The eggs vary from four to seven, and differ from all the known eggs of this family found within the United States, being unspotted. They are glaucous green in color, and the majority are much more glossy than Jays’ eggs generally are. In one hundred and thirty-six specimens examined, all were perfectly immaculate. The articles calls this bird the Arizona Jay. There is no bird by that name and the copiers of these articles added the Green. 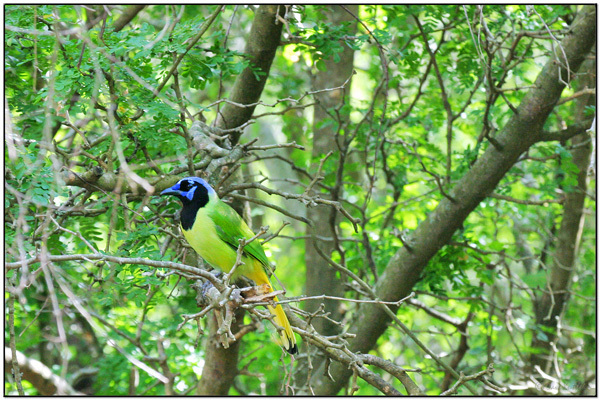 According to the “Color Photograph” this is a Green Jay (Cyanocorax luxuosus) which belongs to the Crows, Jays – Corvidae family. Not sure if this is the bird intended, because Wikipedia and others do not show the Green Jay in Arizona these days. 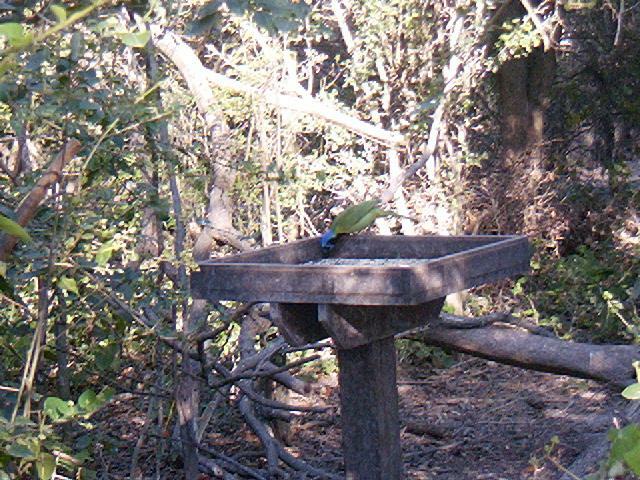 Assuming that it is the Green Jay, we were able to see them “down in the valley” of Texas. We saw them at the Santa Ana NWR and around the valley. Its area stretches from southern Texas south into Mexico and Central America, with a break before the species reappears in a broad sweep across the highlands (primarily the Andes) of South America in Colombia, Venezuela, Ecuador, Peru, and Bolivia. It has been suggested that the North American taxa should be considered separate species, Cyanocorax luxuosus. 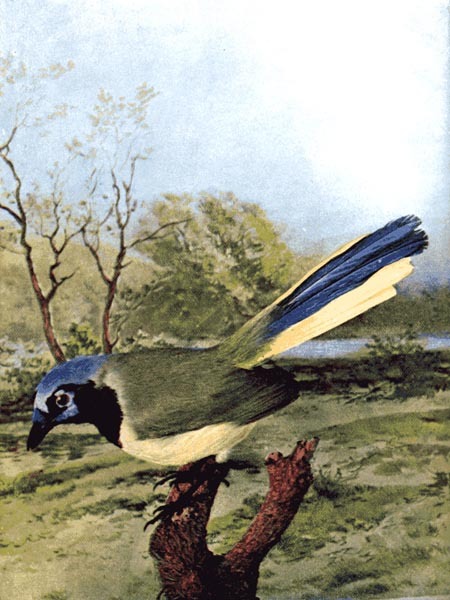 If following this taxonomy, the northern species retains the common name Green Jay, while the South American population, which retains the scientific name C. yncas, is renamed the Inca Jay. Northern Greens are smaller than there southern family and some of the color varies between the two groups. “Green Jays feed on a wide range of insects and other invertebrates and various cereal grains. They take ebony (Ebenopsis spp.) seeds where these occur, and also any oak species’ acorns, which they will cache. Meat and human scraps add to the diet when opportunity arises. Green Jays have been observed using sticks as tools to extract insects from tree bark. Their basic diet consists of arthropods, vertebrates, seeds, and fruit. Green Jays usually build a nest in a tree or in a thorny bush or thicket, and the female lays three to five eggs. Only the female incubates, but both parents take care of the young. In Colombia, the Green Jay is recorded as retaining offspring for several years, and those young help the parents raise more chicks. The Lord has created another beautiful bird for us to enjoy and learn about. 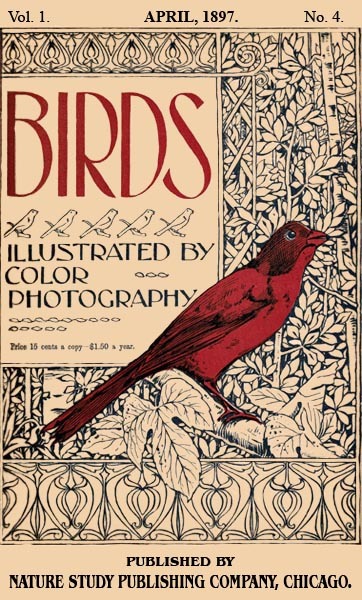 The above article is an article in the monthly serial for April 1897 “designed to promote Knowledge of Bird-Live.” These include Color Photography, as they call them, today they are drawings. There are at least three Volumes that have been digitized by Project Gutenberg. This entry was posted in Birds, Kid's Section and tagged Birds Illustrated by Color Photography, Birdwatching, Christian, Corvidae, From The Past, Green Jay, Home School, Kids, Nature, Vol 1 #4 April 1897, Youth. Bookmark the permalink. Golden Eagle - Fly Like A Bird?